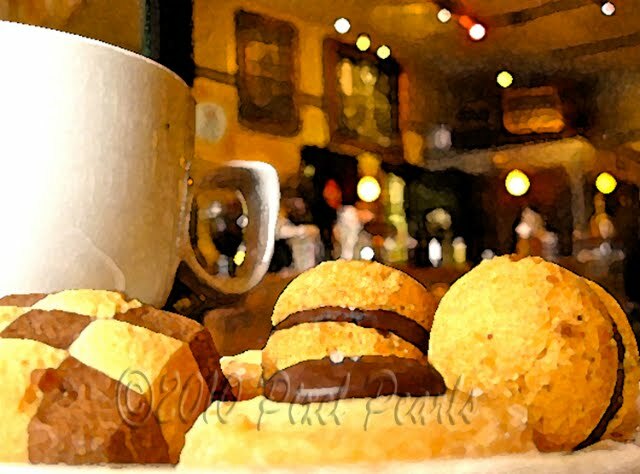 These little Italian cookies from Caffé Piccolo Paradiso are delightfully photogenic. When I stop by for a Shot in the Dark or a Latte and a small plate of cookies I almost always end up taking pictures of them. I adore their petite shapes, their warm color and the elements of their texture, the way the light falls on them through the window as I sit in one of the front bays looking out onto the sidewalk. Luckily they are marvelously rich and tasty too with just the right accent of chocolate. There are usually three varieties. At least one of them is called Baci di Dama, the one with the chocolate filling. While enjoying cookies and coffee it is a treat to look around the small café at what has changed since my last visit; what new painting is on the wall, what new accessories accent the warm Italian décor. Piccolo Paradiso is still one of my favorite area coffee shops. A stop by is the perfect practical antidote to the dreary weather that is so common to the Pacific Northwest. Stop by and see if you don’t agree.